Bikini Bootcamp ~ The Final Day! Wow ~ I can’t believe the 14 days of Bikini Bootcamp have come and are now almost gone. I have to say I completely LOVED this challenge, the workouts, the great recipes and the balance it helped me create in my life. It is a bit time consuming, but, in a good way. I am definitely planning on continuing some aspects of the challenge – the workouts, the eating concepts, fitting in yoga and meditation most days of the week and maybe a spa treatment here or there. I do not think it is realistic for me personally to workout 7 days a week…we all need a little time to rest and recover. I cannot wait to Weigh In tomorrow morning to see my results and take my measurements. I’ll be sure to report back and let you know all the outcome with any final thoughts I have on the book too- yeah! Here we go with my final eats for the BBC challenge. I spent the morning transferring stuff from the old fridge to the new and broke for breakfast around 10 am. 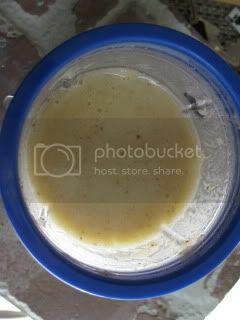 I whipped up a quick Pineapple Smoothie. All whirled up in my Magic Bullet. I actually prefer the sweetened Almond Breeze – it makes it taste more like an ice cream milk shake. 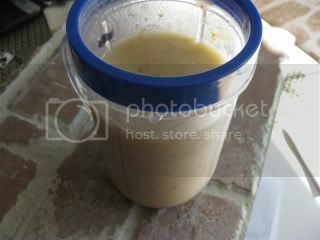 This smoothie would have also been fantastic and creamy using greek yogurt – yum! We spent the morning getting all stocked up at Sam’s Club, checking out new garage doors and such. The Husband has this serious hot dog fascination whenever we go to Home Depot or Sam’s Club. He wanted that for lunch so I had their “veggie snacker”. I have to say I was fairly impressed to see a somewhat healthy option on their menu. This bad boy still packed 310 cal and 21 g of fat if you ate it all – crazy, huh? 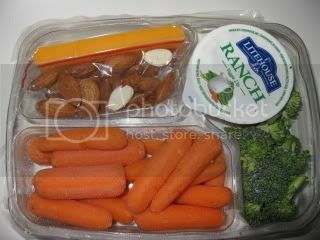 I ate all the veggies, 1/2 the nuts and cheese but left the ranch. It was good at tiding me over. 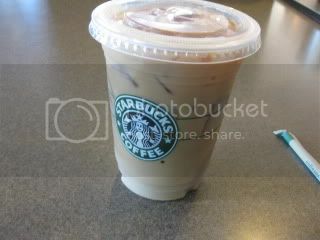 After some more shopping, we decided to take a stroll over to Starbuck’s (my walking for the day). I pondered an ice tea or a fat free latte – the latte one and became my afternoon snack. 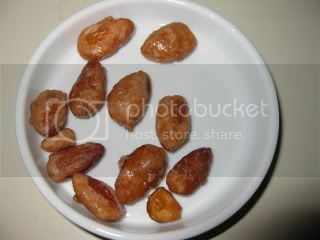 Along with a few butter toffee almonds I bought for The Husband at the farmer’s market a few weeks ago. Comning up next ~ tonight’s VEGAN Mexican dinner – YUM! « The all in one post…. Hmm Sam's Club is actually getting healthier options? I never thought I'd see the day! That Sam's Club box is kind of surprising! I'm used to Costco's pizza, pizza, and more pizza 🙁 That's nice they offer something so healthy! Broccolihut ~ I know – I was thinking I'd have to watch him eat and sip on some iced tea until I got home – yeah! Anne ~ thanks so much for the congrats! K ~ I know – the pizza is gigantic and it actually looked kinda gross with all the grease on top. I'd much rather make my own – yeah for that! Thanks!